I've done what it says: "Think Red Army Chorus." And I find I keep going back to re-read this surreal, improbable gig notification which arrived via Linkedin. As Lenin once said: "For centuries great, brave, lonely men have been telling you what to do." So read on if you're feeling brave, or lonely. Russian Army Day party this Saturday 23 February with Mazaika. You are cordially invited to celebrate with us Russian Army Day this Saturday 23 February. with live music by Mazaika. Sarah Harrison (England) – violin, domra (Russian mandolin). 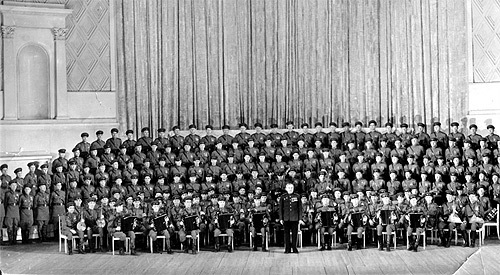 The music program will include Russian soldier songs, songs from the war years (think Red Army Chorus). Plus live dance music from Mazaika's huge repertoire of Russian folk and Gypsy music, Tango, Hot Club Jazz, Latin and Russian and International Pop covers. Tickets: £15 advance online payments only, no tickets at the door. Restaurant needs to know number of diners in order to provide an adequate service.